Nearly two-thirds of the American population takes a botanical dietary supplement or nutraceutical health product. Although this $86 billion dollar industry continues to grow, there is still little scientific research to substantiate the true health benefits of these popular supplements. The research laboratory, supported by a grant from the National Institutes for Health, establishes a new type of building, adapting commercial greenhouse systems to create a research facility for scientific study of nutritional plant physiology and nutraceutical genetics - unlocking the potential of plant materials for promoting health. 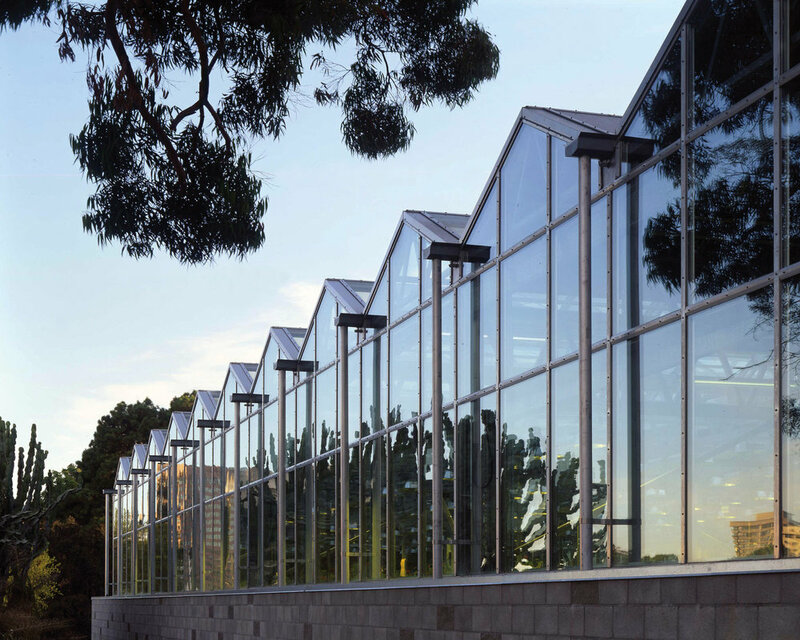 The site overlaps a revered botanical garden at the edge of campus, so we carefully designed the massing of the building to minimize nighttime visibility and to share support services for the garden. The project uses a different formal language than is normally seen in this building typology to successfully transform a kit of parts into a rich environment. The lightly textured masonry foundation greatly enhances the design of what would otherwise be a simple utilitarian glass structure. The masonry foundation was also a nice solution for anchoring the building to a challenging site.